Writing the image using Etcher. See the screenshot below. 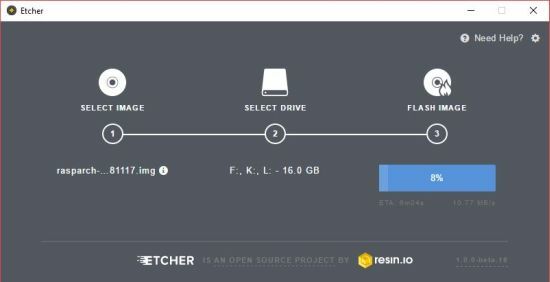 If you have downloaded and installed one of my previous version of RaspArch before 180402 you can still use the Micro SD Card with RaspArch on the new Raspberry Pi 3 Model B+ after a full upgrade of the system. Commands: pacman -Sy followed by pacman -Syu. Most important the old kernel will automatically be replaced by kernel 4.14.80-1-ARCH. 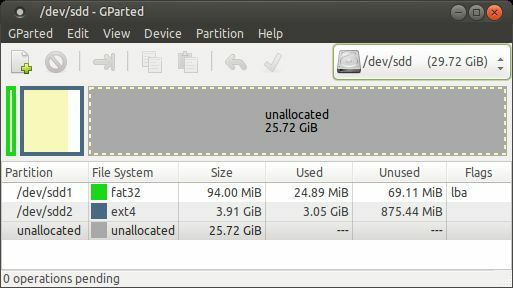 A new kernel – 4.14.80-1-ARCH. All included packages have been updated to the latest version as of 181117. I have added support for Yaourt – a Pacman Fronted. I have also installed PulseAudio. Finally the sound works very well in RaspArch. Nice if you like YouTube. Note: To be able to install Yaourt I had to install a lot of development tools. 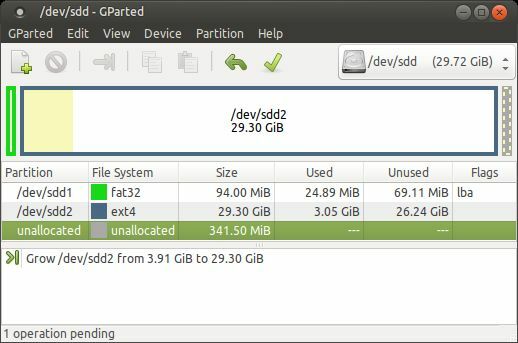 When you have installed RaspArch to your Micro SD Card you can use the system like any other Arch Linux system. I.e. install new programs etc. Arch motto is KISS (Keep It Simple Stupid). 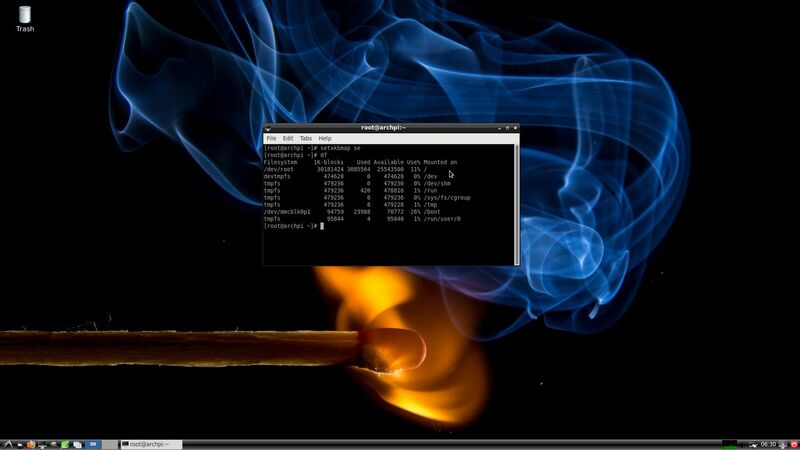 RaspArch uses kernel 4.14.31-1-ARCH and the LXDE Desktop environment. After the boot process is ready you will end up at LightDM‘s login page – see the screenshot below. 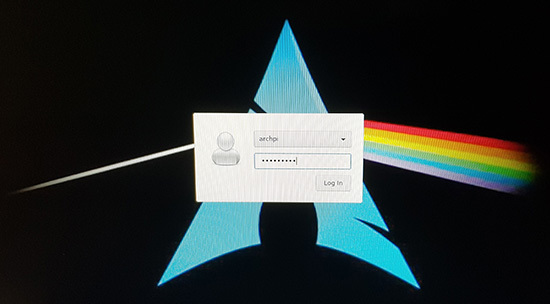 Log in as the ordinary user archpi with password raspberry or as root (“other”) with password root. While logged in as archpi you can use Sudo to become root. Example commands: sudo su and sudo pcmanfm. Note: You can also use Yaourt – see below. Yaourt is also very simple to use. 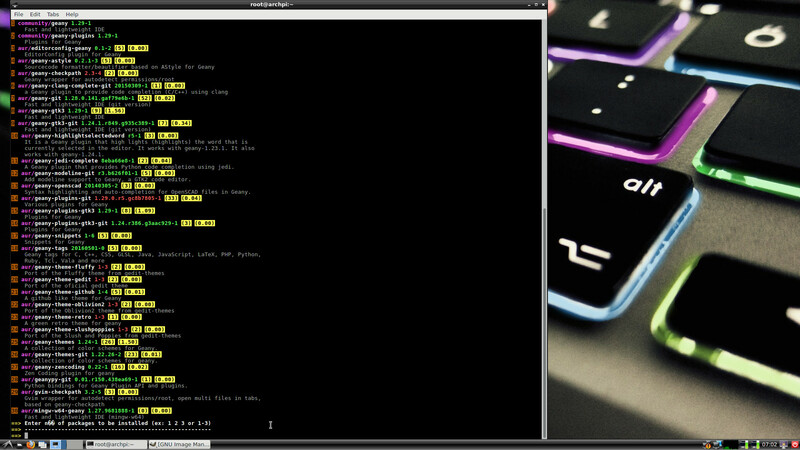 Yaourt is a command line interface program which complete pacman for installing software on Archlinux. You should normally use Pacman as described above. If, however, you want to install a special program which can’t be found using Pacman you can try Yaourt. The command is yaourt MyUsefulProgram. Normally you will get a lot of alternatives. Install the one you want. Watch this screenshot when I wanted to install Geany using Yaourt. In the first place I installed Yaourt to be able to install Google Chrome (only to learn that Google Chrome isn’t available for the ARM architecture). 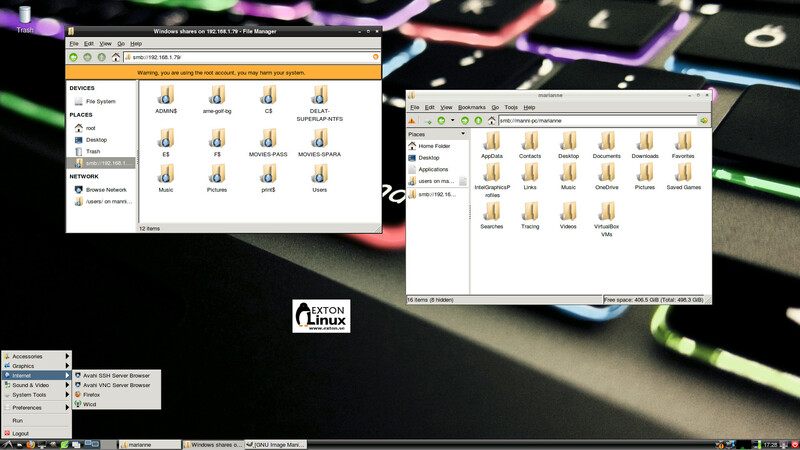 NOTE: To be able to use Yaourt you’ll have to log in to LXDE as the ordinary user archpi. (You can’t use Yaourt as root for security reasons). Use Win32 Disk Imager or Etcher – see above. Unzip the downloaded file rasparch-exton-1160mb-181117.zip. You will get the image file rasparch-exton-4300mb-181117.img, which is the file you shall install to your micro SD card. For best performance you should use SD Cards of good quality. I can recommend Samsung MicroSD Pro Plus 32GB Class 10. 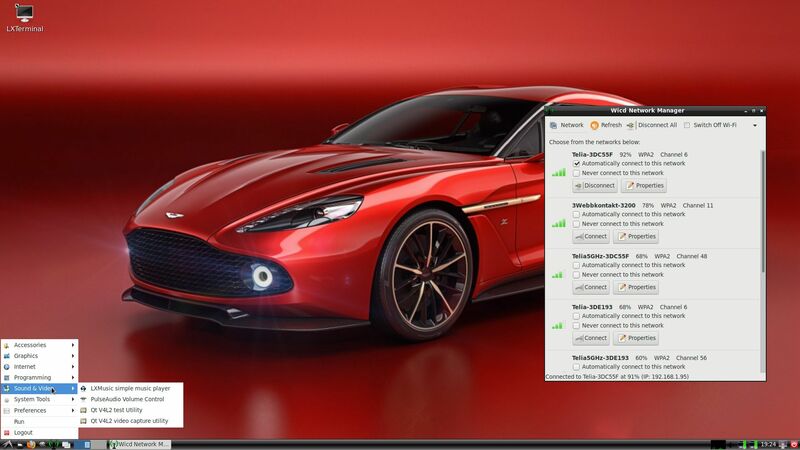 Write speed up to 95 MB/s. Also Samsung MicroSD EVO 16GB Class 10. Write speed up to 48 MB/s. Price 25 $ respectively 12 $ (in Sweden). 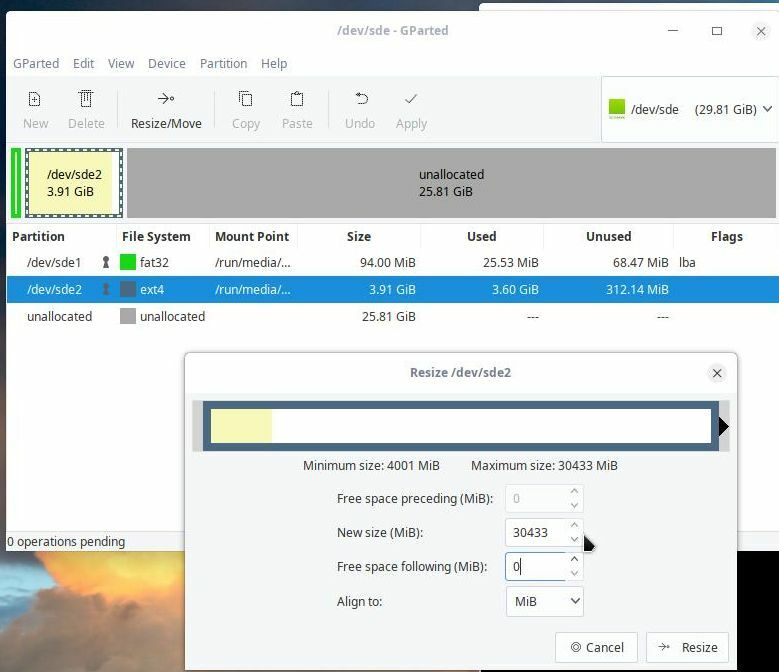 After that you can connect to your Windows computers via PCManFM – watch this screenshot. 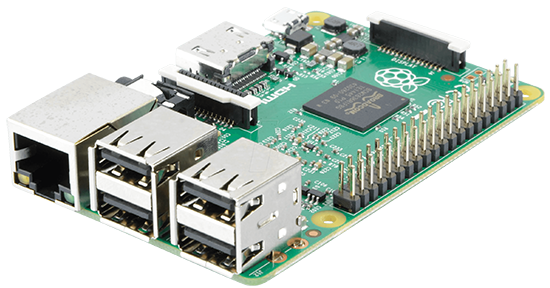 (My Raspberry Pi 3 Model B running RaspArch is connected to two of my computers in my home network). In Build 181117 I’ve installed alsa-utils, PulseAudio and Pavucontrol. The sound works alright now. From Arch Linux for Raspberry Pi Wiki I learned this. If you want/need sound in RaspArch you should follow the instruction below. 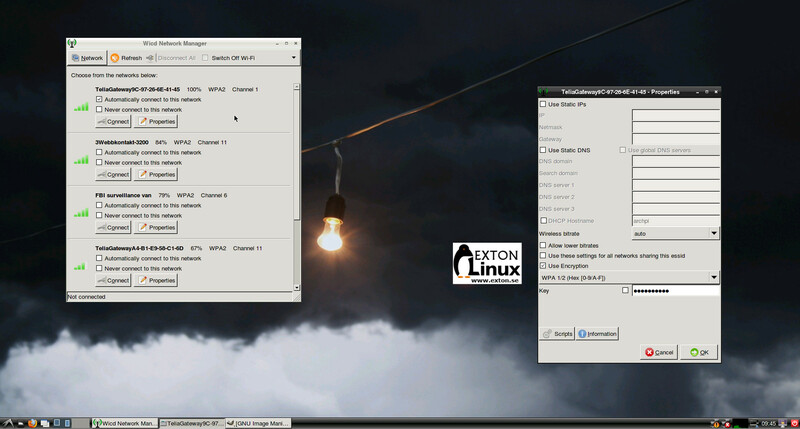 DOWNLOAD (rasparch-exton-1160mb-181117.zip) for free from SourceForge.net. You can also download RaspArch from the Swedish Linux Society. This entry was posted in Exton Linux, Linux, RaspArch and tagged Arch Linux, Etcher, exton, Firefox, Geany, Gimp, kernel 4.14.80-1-ARCH, LXDE, Pacman, RaspArch, Raspberry Pi 3 Model B, Sudo, Yaourt. Bookmark the permalink. 3 Responses to RaspArch Build 181117 :: Run Arch Linux on your new Raspberry Pi 3 Model B+ computer :: Install using Win32 Disk Imager or Etcher in Windows! I love the Raspex Arch Linux with the LXDE desktop & I am seeing marked inprovment over all with my Pi 3B+. The one problem I have come across is that I am unable to compile certain program with out the kernel headers & I am unable to find them. Could you please point me to where I can find them? The headers I need are for: Linux archpi 4.14.80-1-ARCH #1 SMP Tue Nov 13 01:49:19 UTC 2018 armv7l GNU/Linux. I installed the latest RaspArch headless and got it running on an Rpi 3 B.
Connect via ssh no problem. Can update system, install software. But how do I connect via vnc? 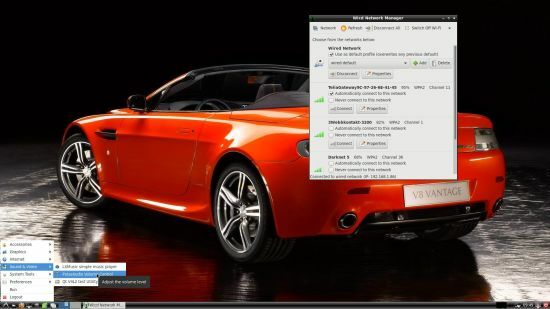 With TigerVNC on Rpi as server and real-VNC-viewer as client the server refuses connecting. Using this vncviewer I’ve got no problems with the latest Raspian. finally, after reading some information on configuring archlinux, I got it working. Thank you for your work on RaspArch, it’s really great.